A rather idiosyncratic gin that is more of a bitter tonic than a gin to me. Notes: Another member of a rather idiosyncratic gin family made in a handmade copper pot still and infused with green grape flowers among many other ingredients. 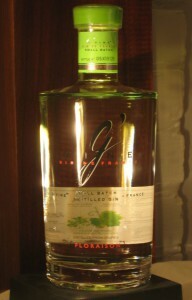 Using a ugni blanc (cognac grape) alcohol base, that give it a unique aroma and flavor profile, G’Vine was one of the pioneers among gins to use a grape alcohol rather than the traditional grain.This may make it attractive to celiacs and other gluten intolerant folks. They also make another version of G’Vine gin called Florasion. This version is distingushed from it’s predecessor in that it uses a lesser degree of the vineflower making it closer to a London Dry style and allowing the juniper and nutmeg more free rein in the bouquet and taste. The alcohol is also slightly higher which aids mixability. Appearance: Crystal clear, a few legs on swirling. Slightly oily appearance to body. Scalloped edgeline then droplets forming. First Impression: To some degree much like it’s sister gin – more like opening a spice jar than a regular gin, cassia bark, cubeb, coriander, cardamon, nutmeg, licorice, then the lime and orange citrus and other aromatics adding to the blend as it breathes. But with a fair amount of more familiar juniper and a nice dose of nutmeg adding to the melange. Taste: Juniper, then a drying nutmeg/myrrh tasting parade of herbs,cinchona tree bark, melange of spices that taste more like a bitter- or chinese medicine then a gin. Hits the toungue on the midline edges with a astringent drying. Drinks: Not really sure what one could do with it. Bottle: Squat cylindrical smoke accented clear glass bottle with a short neck and heavy bottom- resembles a apothecary bottle from years past. Label and artwork are however très moderne. Differentiated from its older sibling buy the silver smoke coloration of bottle and cap whereas the Floraison has light green packaging accents. Other: These gins are also part of the DWSE Classic and Vintage Spiritsportfolio of DSWE which much to our relief (and thankfulness) has decided to assemble a portfoilio of high quality spirits for classic, vintage and just plain wonderful cocktails (O.K. we don’t understand G’Vine gins but the rest of the portfolio is wonderful). They also have backed up their portfolio with training their sales people so they can speak intelligently about their products – something that the industry as a whole has neglected for the most part in our opinion. We applaud their efforts to assemble and nurture a stable of artisanal spirits and look forward to any new additions. Final Thoughts: This one reminds me more of a bitter, more like an Amaro or a juniper flavored Campari. Astringent and a bit over the top in the herbal department. Website is well laid out but not terribly informative. No details on distillation and heavy emphasis on the grape flowers and little else. More information would be useful.